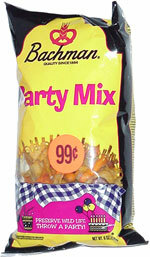 Taste test: This is a very cheesy, salty and tasty party mix consisting of pretzel sticks, small knotted pretzels, Crunchy Jax, barbecue-flavored corn chips and nacho cheese tortilla chips. It's very good combination, thanks in no small part to the high level of cheese on the Jax and the generous amount of flavoring and salt on the corn and tortilla chips, which provides the perfect balance for the more ordinary-tasting pretzels. This bag emptied fairly rapidly after being placed in the chip bowl. Smell test: Good cheesy smell. 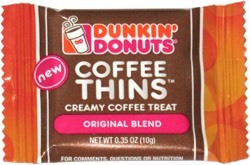 This snack was discovered by Jeremy at Garden City Market, Cranston, Rhode Island. Review published .